With Instant Translator turns your device into a translator of conversations between different languages, so you can break language barriers in your conversations with foreigners, into your tours… or just practice a language . 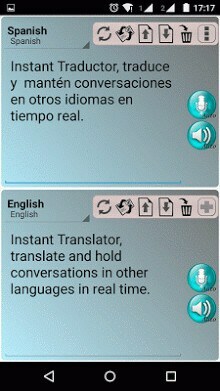 It is very easy and quick to use , you just have to say a sentence or write a text and you will see and hear your translation. You can hear the translation as many times as necessary, a written text translated into multiple languages or take a picture of a text and get its translation ? ?and all for free. 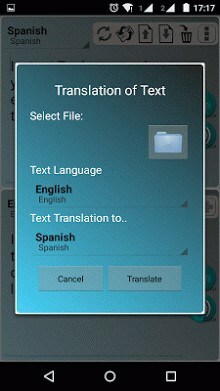 – Audio playback of translations. – Copying and pasting text to fast clipboard. Afrikaans, Albanian, Arabic, Armenian , Azerbaijani (Azeri), Basque, Belarusian, Bengali , Bulgarian , Catalan, Cebuano, Chinese Simpleficado, Chinese Traditional, Croatian , Czech, Danish , Dutch, English , Esperanto, Estonian , Finnish , French , Galician, Georgian , German, Greek , Guyaratí , Haitian Creole , Hausa, Hebrew, Hindi , Hmong, Hungarian , Icelandic , Igbo, Indonesian , Irish , Italian , Japanese , Javanese, Kannada , Khmer (Khmer), Korean , Lao, Latin, Latvian, Lithuanian , Macedoneo , Malay , Maltese, Maori, Marathi, Mongolian, Nepali, Norwegian , Persian , Polish , Portuguese , Punjabi, Romanian, Russian, Serbian , Slovak , Slovenian, Somali, Spanish , Swahili, Swedish , Tagalog, Tamil , Telugu , Thai, Turkish , Ukrainian , Urdu , Vietnamese , Welsh, Yiddish, Yoruba, Zulu. Note : Instant Translator uses the Google APIs to perform the translation, because it is necessary that your device has an Internet connection to perform translations. If the translator is to your liking, we thank you positively qualify for further improvement. If you find an error , report it so we can fix it at the earliest. Compatible with Android devices with version 2.3 and above. apps are very helpful things for anyone.